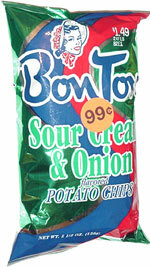 Taste test: These are good wide-rippled potato chips with a nice sour cream and onion flavor. They feature a fairly generous helping of flavor powder with a good mix of both sour cream and onion. They're very, very crisp and somewhat thick, giving them a great overall feel and texture. An old-fashioned sort of chip, tasty and good. Smell test: Kind of odd. This snack was discovered by Jeremy at Caribe Market, Providence, Rhode Island. Review published .